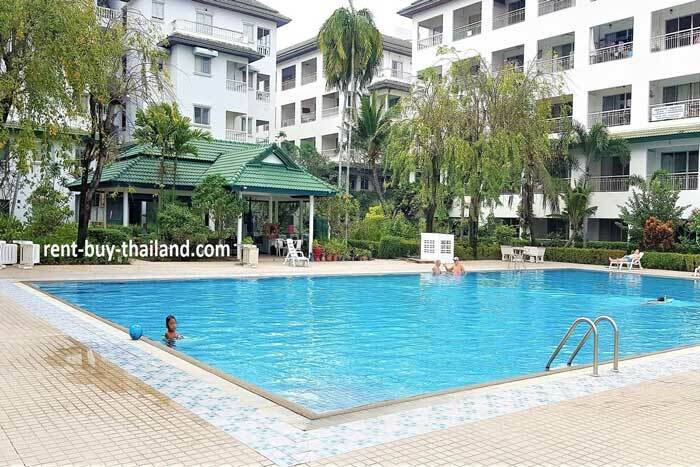 Baan Suan Lalana is an immaculately maintained complex set in luscious gardens and is just 800 meters from Jomtien Beach. Buy condo - Prices start from 1.19 million Thai Baht. 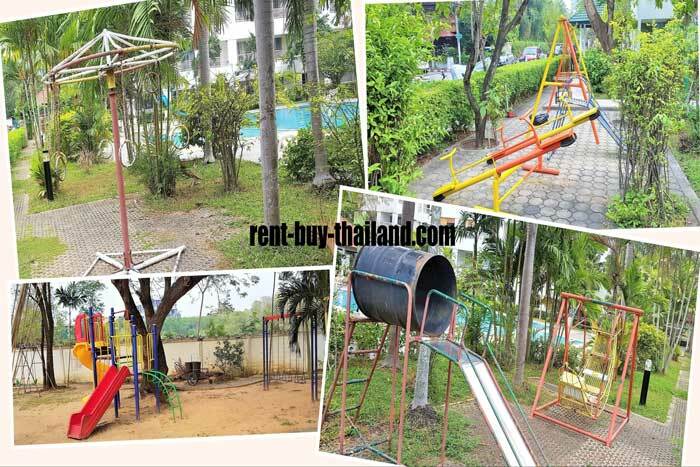 Rent condo - from 10,000 Thai Baht per month. Baan Suan Lalana is a beautiful, well maintained condominium complex located in a peaceful area of Jomtien. It's name translates from Thai as "beautiful garden home" and is set in luscious green gardens, giving it a village feel and tranquil atmosphere. The condominium offers a lovely peaceful, secure and relaxed environment for residents. This is a private and popular resort complex, located on Chaiyapruek Road, approximately 800 meters from Jomtien Beach, where you will find an abundance of restaurants, shops, markets, bars and water-sports along the 6 km beautiful sandy beach. You can find various restaurants in close proximity to the complex, along with shops, convenience stores and bars. 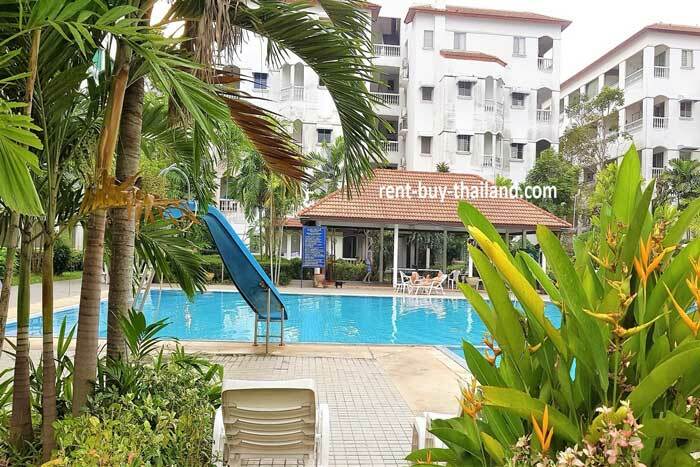 Jomtien Beach is a short walk, drive or ride on the Baht bus away, and from here there are easy connections into Central Pattaya. There is easy access to Sukhumvit Road from the complex (located 600 meters from the main road), which has good transport links to the north (Bangkok) and south (Rayong), with their many attractions and golf courses. Jomtien is a quieter beach area than, and to the south of, Pattaya - with a fantastic 6 km of sandy beach. Along the beach there are numerous beach chairs where food and drinks can be purchased from the beach vendors while you relax. Jomtien Beach also offers a range of water-sports for your enjoyment, including jet skiing, windsurfing, banana boating and scuba diving to name a few! Jomtien offers numerous restaurants with a mix of international and traditional Thai restaurants and cuisines. In addition Jomtien has a wide and varied nightlife catering for all tastes, from family orientated establishments, and cabaret show, to it's own version of Walking Street (Super Town). In the area you will also find beauty salons, massage parlors where you can enjoy a range of relaxation treatments and traditional Thai massages, numerous shops and markets offering items such as clothing, souvenirs and fresh fruit and vegetables. There are two night markets in Jomtien, one located on Beach Road which is open every night and popular for its many cheap food stalls. The other is Thepprasit Night Market, which is held every Friday, Saturday and Sunday evening and well worth a visit - this is one of Pattaya's largest markets with many stalls offering a variety of wares from clothing, mementos and electronics, to pets - and a large food area where you can sample a huge range of delicious authentic Thai street food. Jomtien is a great base from which to explore Pattaya and its many attractions such as its many golf courses, Pattaya Floating Market, Nong Nooch Tropical Botanical Garden and the Sanctuary of Truth. A short ride on the Baht Bus from Jomtien Beach Road will take you into Central Pattaya, with its abundance of shops, restaurants and bars, a vibrant night life (such as the famous Walking Street), plenty of tourist attractions to keep you entertained and 4 km of beach offering various water-sports and trips to the nearby scenic island of Koh Larn (Coral Island) with it's white sandy beaches and crystal clear waters providing an excellent opportunity for snorkeling. If you want to explore further afield there are many tourist agents offering a variety of day trips and excursions to attractions such as Angkor Wat in Cambodia, Erawan National Park, the Bridge over the River Kwai and Bangkok.